lifetime of pages: HeArt & Soul DT debut and SOUS Sketch Release! HeArt & Soul DT debut and SOUS Sketch Release! to be on the Design Team for the brand new challenge site, HeArt & Soul! 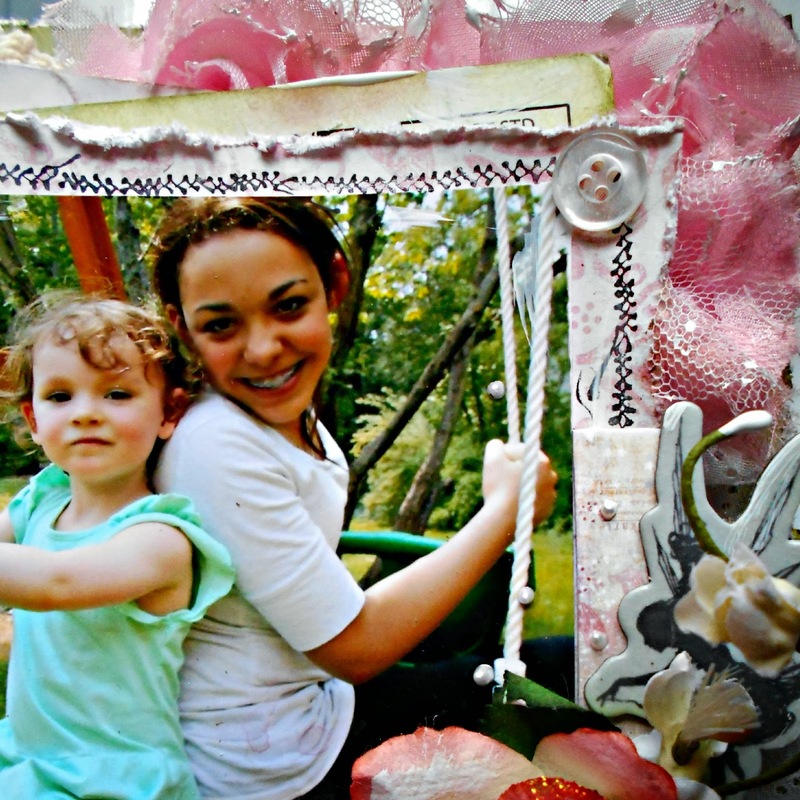 The Color Room and Scrap for Help have merged into one great site with challenges and inspiration galore! I just received the spankin' new Prima Princess papers from Swirlydoos' Boutique fell in love! The junk mail I used was some envelopes that I inked with Distress Ink in Peeled Paint and Victorian Velvet and used as matting. I love my new Prima stitch stamps too since I hate sewing but want the look. I used embossing powder and TCW Chickenwire mask for the first layer of the background, but it became mostly hidden by the time I added all my layers! After inking the papers,I applied white texture paste using the Ledger mask by TCW. I really like the subtle effect and dimension it brings to the page. 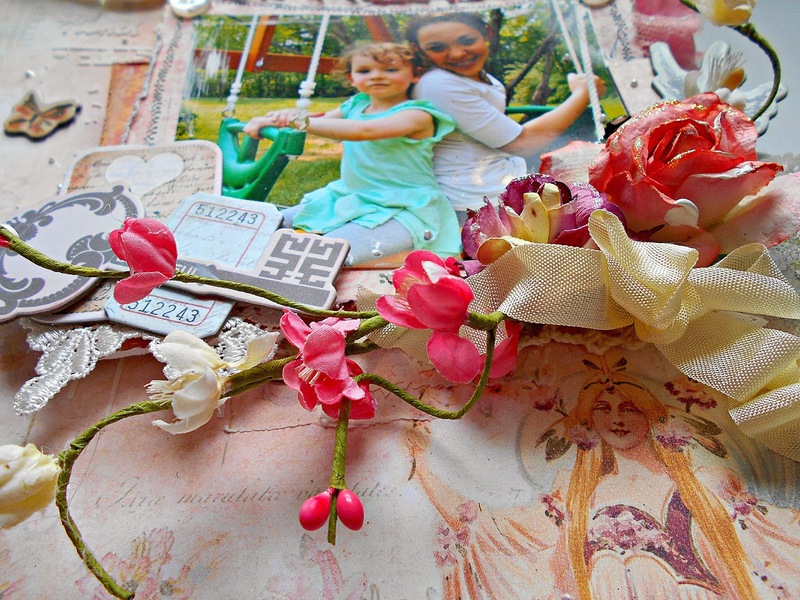 I broke up a Prima Lyrics vine and tucked it in among my clusters of flowers and Prima Princess Chipboard. I used clear embossing on the fairy and butterflies for some shine, plus lots of Diamond Stickles and Pearl Dots. 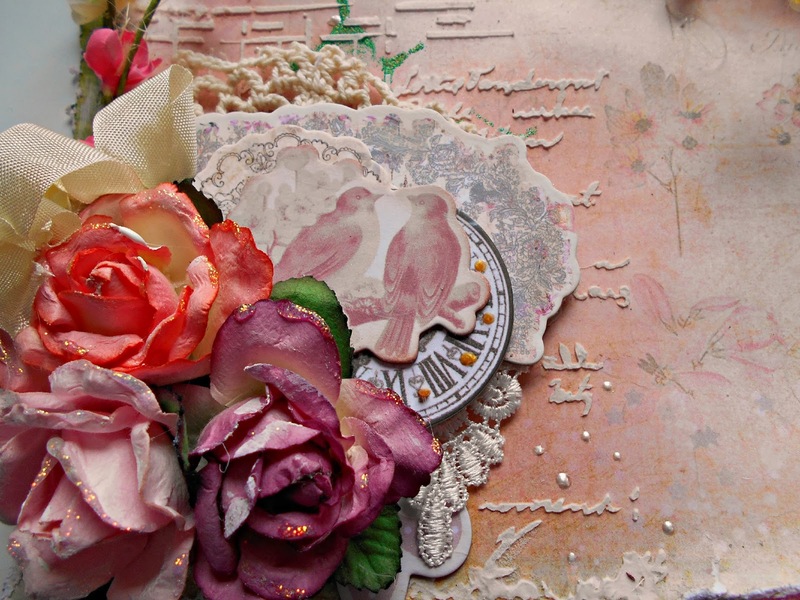 Then,as always, I'm not happy until I stuff random bits of lace and ribbon and such among my distressed layers. To read all about the new HeArt & Soul Challenge and see the rest of the Design team's creations click here. 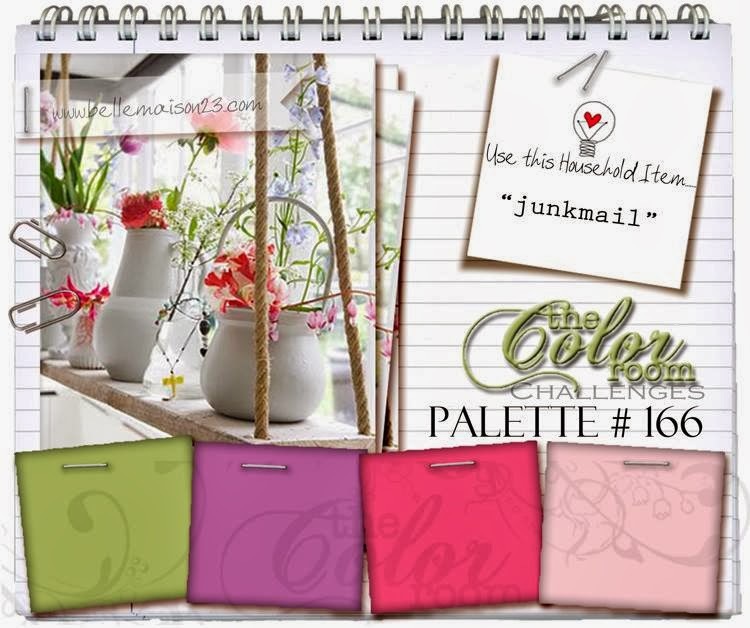 To see the new Stuck on U Sketch created by our own talented Nanne and see what the rest of the Design Team created,click here. Glad to be teamies on something!!!! 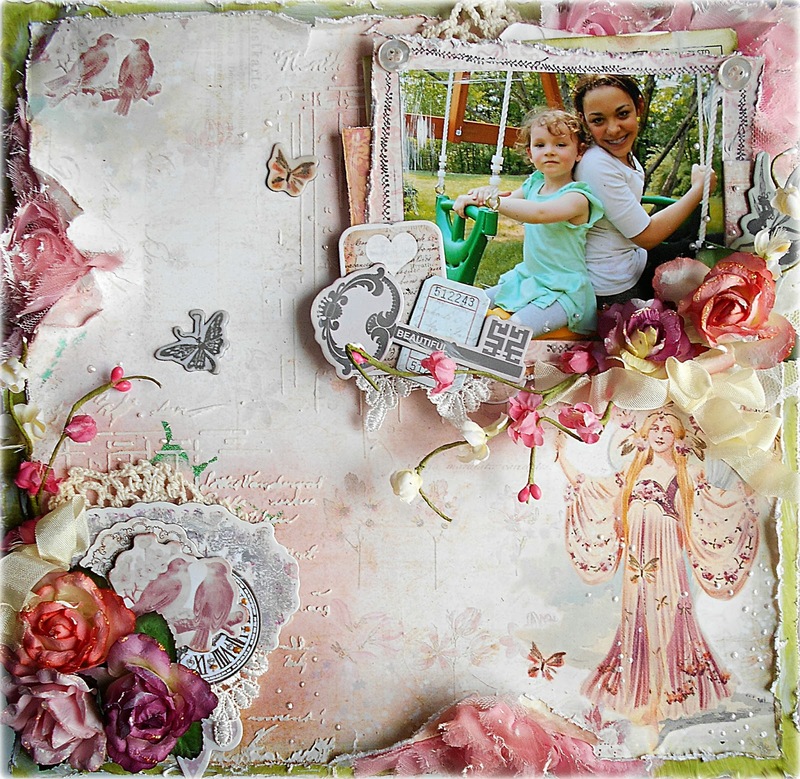 What a gorgeous layout, Tracey! I am waiting for those papers to arrive any day as well! congrats on your new design team! WOW Tracey! This page is absolutely beautiful! I love your background and especially love the photo! And no surprise that you are on so many wonderful design teams - your talent abounds, my friend! Thanks for sharing it with all of us! Lovely color palette and such a great take on the sketch! Love your gorgeous flower arranging! Gorgeous pic and layout! Your work is always amazing and inspiring. You rock! !